David became the most recent FAB Dock customer on the Gold Coast when he took delivery to protect his amazing 6.8 metre Haines Hunter. I am on boats of all shapes and sizes all day long and it never ceases to amaze me the ingenious ideas that my fellow boaties come up with in customising their boats to exactly how they want them. Some boat manufacturers could do worse than have a look at some of these innovative ideas. 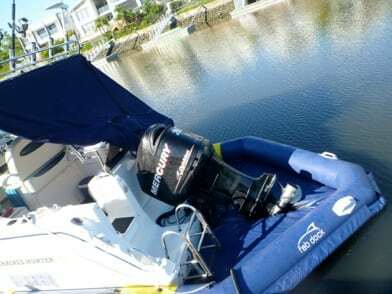 What David has managed to squeeze onto his boat, without compromising the necessary space for fishing and relaxing, has to be seen to be believed. Have you ever seen a live-a-board 6.8 metre? And along with the many and growing list of benefits associated with owning a FAB Dock, we can add the fact that it makes the boat more stable when it is wrapped up in one – David will attest to that.